Do the legs of your furniture bear the claw marks of your cat? Is scratching the furniture abnormal? If so, you may want to consider trimming your cat’s claws. When cats scratch, it is a normal part of behavior that is hard-wired into their genes. They do it to maintain their feline physique as well as to hone those claws into sharp little weapons. Unfortunately, both you and your furniture can suffer as a result. By taking their claws into your own hands, you can nip this problem in the bud, or shall we say clip this problem by the claw? Trimming your cat’s claws can be a daunting task. It is something you would be hard-pressed to be able to do on your own. So before you even try to start, recruit a helper to hold down your cat while you trim its nails. Do you have the necessary tools to care for your kitty’s claws? First, you need a sharp pair of nail clippers. You can purchase a set that is specially made to hold a cat’s claw in place while you cut. You can purchase these special clippers from your veterinarian or a pet store. Otherwise, a normal pair of human clippers or nail scissors should do just fine. When you are ready to start trimming your cat’s claws, have your helper hold the cat gently, but firmly. Grasp one of the cat’s paws in your hand and press down on one of the toes to extend the claw. Do you see where the nail goes up to a pink area? That pink area is called the “quick” and will bleed if you accidentally cut into it. It also would be painful for the cat. Cut the nail quickly and cleanly just below the pink area. Now, can you repeat that process for the remaining nineteen or so nails? The answer is probably not. Unless you sedate your cat (not really recommended) or your feline is just really, really laid back, you will have to complete the claw clipping in several stages. In the claw clipping process, do not neglect your kitty’s dewclaws. These are like the equivalent to the thumb of a human and are only found on the front paws. Be sure when you stop to take a break that you praise your family feline and even give it a treat for good behavior. Ok, what happens if you do accidentally clip into the “quick” of the cat’s claw? First of all, stay calm. Your cat will probably be freaked enough and fighting in the arms of your helper. You need to reassure your cat and apply a slight pressure to the tip of that claw until the bleeding stops. If the cat isn’t fighting too much, apply an antiseptic that dries quickly. Avoiding infection is a smart idea. If you are ever in doubt as to how much of the claw you should clip, trim a little less than you probably would go for. It is always better to be safe than sorry. Claw care for your kitty should happen every two to three weeks optimistically or on an as-needed basis. If possible, keep an eye on your cat’s disposition. If your fur ball seems in a laidback mood, try trimming its nails at that time. It is possible to cut them, all on your own, but if your cat takes exception to the fact that you have a pair of clippers in your hand, it can be a difficult task. And if your cat is a bit of a hellion, ask your veterinarian or a professional groomer to clip your cat’s claws. 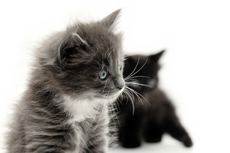 They have the experience, special training and some tips and secrets to getting a cat to cooperate. Sometimes, however, clipping your cat’s claws does not forestall the scratching in your home. If you do not want to give your cat away to a new home, you might want to consider declawing your cat. This involves removing the claws, through a surgical process, as well as the tissue that the claws draw back into. Talk with your veterinarian about this surgery and whether or not it might be the next step you should take with your cat. As with all medical procedures, there are risks involved like slow healing and infection. Before taking that drastic step into declawing, try various behavior modification techniques. But most of all, just know that it is natural as breathing for your cat to bare its claws and scratch. If you are lucky, you can train it to use a scratching post to do most of its handiwork.